I have just released versions 3.2.0 of KDE Partition Manager and KPMcore library. Note that if you use Calamares installer you need version 3.1.4 or later, earlier versions of Calamares will not compile against new kpmcore. Detection support for ISO9660 file system. KPMcore now has lighter KDE Frameworks dependencies, KIO is no longer necessary, KIconThemes dependency moved from kpmcore to Partition Manager. Our own fstab parser and writer. Before we used to rely on glibc but it had no support for reading fstab comments, so they were lost when writing fstab. – File system label widget (QLineEdit) now validates its input for certain file systems (at the moment only FAT and UDF), not just checks maximum label length. At the moment I’m slowly experimenting with refactoring kpmcore (not requiring libparted) but it is not part of the current release. 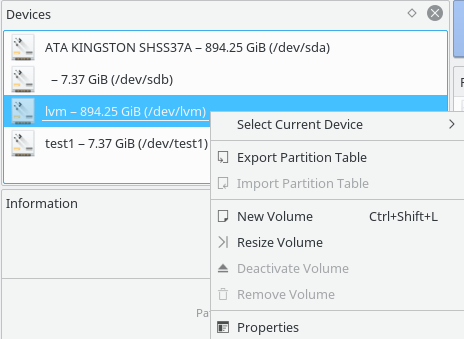 The new backend that might appear in later releases can now delete and create partitions but cannot do other stuff (creating partition table, resizing/moving partitions, etc). Hopefully, this will make running KDE Partition Manager and possibly Calamares rootlessly easier. Maybe a GSoC project for next year to finish rootless support if anybody is interested. There are also a few small portability fixes. In the future even this might be possible (feel free to help). Sorry for non Plasma screenshot :), I just used Live CD, so didn’t bother installing another desktop into RAM.